Sacramento City Hall is located at 915 I Street, Sacramento, CA 95814; phone: 916-264-5011. Photo: Governor J. Neely Johnson House, ca. 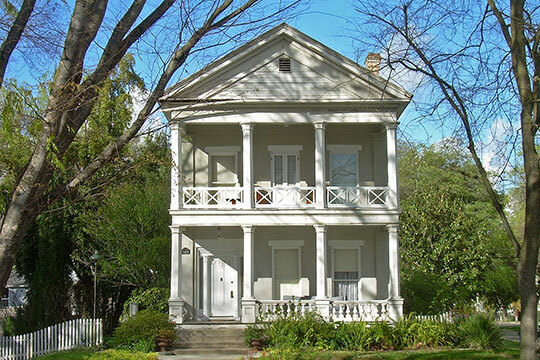 1856, 1029 F Street, Sacramento, CA. Listed on National Register of Historic Places in 1976. Photographed by user:Savid Sawyer, 2008, (own work) [cc-by-3.0 (creativecommons.org/licenses/by/3.0)], via Wikimedia Commons, accessed August, 2015. Flat stretches of unclaimed land, the navigable river, which was named Sacramento in honor of the sacrament, by Jose Moraga, commandant of the presidio of San Jose, and tractable Indians for workers drew the attention of Capt. John Augustus Sutter, the pioneer settler, in 1839. The Swiss ex-army officer took up a 50,000-acre grant by swearing allegiance to the Mexican flag, and built a principality named "New Helvetia" in memory of the old country. He ruled in baronial splendor, with Indians as his subjects, and a fort of timber and adobe brick as his castle, with twelve guns mounted on the ramparts. Sutter built forges and shops, grazed herds on his lands, trapped for furs, and carried on a lively trade. The spot was a haven for settlers in the tide of overland emigration in the early 1840's. In 1848 the town of Sacramento was laid out on Sutter's farm, and the first lots were sold in January, 1849. It was Sutter's boss carpenter, James W. Marshall, who, on January 24, 1848, found the first gold flake while building a mill for Sutter near Coloma on the South Fork of the American River, which resulted in the great gold rush of 1849 and the 1850's and in California's admission to the Union as a State. It also led to Sutter's ruin. Trampling hordes from the East overran his hospitable fort, stole his cattle, drove off his Indians, disputed his rights to the land. His white retainers deserted for the mines. Meantime, millions of dollars in gold dust passed over Sutter's landing. He moved to Pennsylvania in 1873, with only a small pension from California, and died at Washington, D.C., in 1880, after vainly beseeching Congress for the restoration of his property. The settlement became the supply center for the northern mines of the mother lode. Thousands of gold-hungry men came pouring in to outfit for the diggings. The 1850 census showed 6,820, and the population soon jumped to 10,000, with gold seekers camped along the river bank in tents, frame houses, and even under trees; a packing box or a strip of canvas was considered good housing. Bearded men from the mines flashed pokes of gold dust with assumed indifference, and spent grandly in saloons, fandango halls, and gambling houses. The most profitable mining was done by entrepreneurs, who took it out of the miners' pockets. Bitter struggles took place between squatters and men who claimed titles to farmlands. Three disastrous floods came between 1849 and 1853, and in 1852 a fire wiped out two-thirds of the town. In 1849 Sacramento had offered $1,000,000 for the honor of being the State capital. The Legislature met in 1852, sitting on hot ashes, and when it officially became the capital in 1854, flood debris was still in evidence. The floods caused epidemics, and corpses were shoved into the swollen river to drift away. Levees were finally built, and the town pulled itself up out of the foot-deep dust of summer and the hub-deep mire of the rainy season. For many years the water remained unpalatable for those who had the temerity to drink it. Few did. In 1856 Sacramento was the terminus of the first railroad in California, built as a short line to Folsom by Theodore Dehone Judah, the young engineer who planned the first transcontinental railroad through the passes of the Sierra Nevada. Four years later came the Pony Express, which ran until 1861, when the transcontinental telegraph went through. The Central Pacific Railroad joined East and West in 1869. Judah's financial sponsors were all Sacramento storekeepers: Collis P. Huntington, Mark Hopkins, Charles Crocker, and Leland Stanford, the "Big Four." The Central Pacific branched out and became the Southern Pacific, the "octopus" of Frank Norris' novel, which for 40 years practically controlled the State. Large-scale wheat growing and cattle raising soon after lost their lead to more lucrative fields of fruit, vineyards, cotton, and vegetables. Land prices rose, and Sacramento's prosperity with them. Sacramento's position as the capital was challenged by Berkeley in 1907, and later by San Jose and Monterey, but with little effect. The river channel was dredged in 1911, and seagoing vessels could reach the city when the river stage was high. The early years of depression saw several State hunger marches, and in 1938 refugees from the labor troubles in Nevada City camped for a week outside the fairgrounds. Some of the earliest unions in California were formed in Sacramento, which was rated a "good town" for labor. Industry got a start with the gold rush, and soon boiler plants, farm machine factories,, breweries, carriage shops, and processing plants were humming. Federal Writers' Project, Works Progress Administration, California: A Guide to the Golden State, American Guide Series, Hastings House, Publishers, New York, 1939.